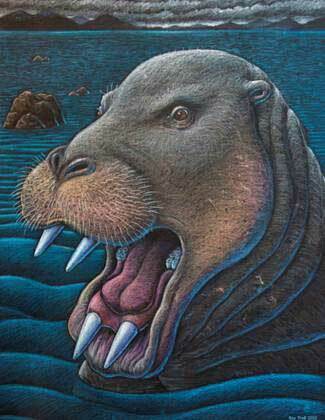 An odd set of fossils that were once on display at a tribal office in Alaska have turned out to be a “strange” new species of marine mammal unlike any living today, scientists say. The fossils contain the remains of at least four specimens — including a baby — of big and bewildering sea creatures known as desmostylians, enigmatic animals whose place in mammals’ evolutionary history remains unclear. 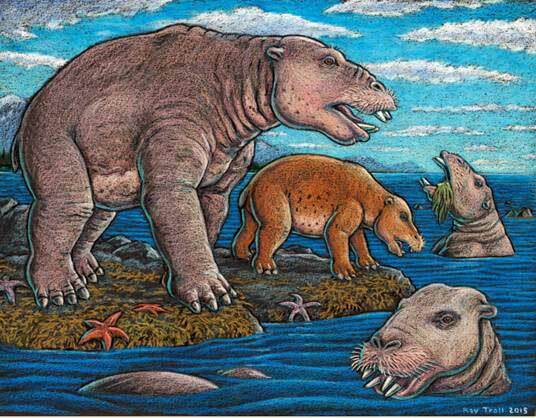 Desmostylians, or desmos, were vaguely hippo-like in size and stature, but with elongated snouts and prominent tusks sprouting from their mouths. Judging by their unusual cylindrical teeth and powerful jaws, they fed exclusively on aquatic plants like algae and seagrass in shallow coastal waters. But their most distinctive trait seems to be how they ate: by virtually inhaling their food — rooting it up with their tusks and then sucking it right down their throats. “No other mammal eats like that,” said Dr. Louis Jacobs, a paleontologist at Southern Methodist University, in a press statement. Scientists had once likened desmos to large herbivorous mammals such as elephants, manatees, and dugongs, but which living group they’re most closely related to remains unresolved. Their classification may be even less clear given their head and neck anatomy — which the new specimens have helped clarify, because they reveal that desmostylians had a truly unique eating style. “The new animal … made us realize that desmos do not chew like any other mammal,” Jacobs said. The fossils were originally discovered by Alaska Natives on the remote Aleutian island of Unalaska, during a construction project. When Dr. Anthony Fiorillo, a paleontologist with Texas’ Perot Museum of Nature and Science, happened to be in Alaska lecturing, some locals notified him of the specimens, which had been on display at the Unalaska village headquarters. “The fruits of that lecture were that it started the networking with the community, which in turn led us to a small, but very important collection of fossils that had been unearthed in the town when they built a school a few years earlier,” Fiorillo said in the statement. The animals only seem to have existed as a distinct group from about 33 million years ago until their disappearance 10 million years ago — in geological time scales, scarcely an instant. And the Unalaska fossils fall right in the middle of that narrow time span, dated to 23 million years ago. Desmos also inhabited a rather restricted range: the shallow coastal waters of the North Pacific. “That’s the only place they’re known in the world — from Baja, California, up along the west coast of North America, around the Alaska Peninsula, the storm-battered Aleutian Islands, to Russia’s Kamchatka Peninsula and Sakhalin Island, to the Japanese islands,” Jacobs said. What’s more, the inclusion of a baby desmo among the newly found fossils adds crucial new data about the animals’ breeding and rearing habits, Jacobs noted. “The baby tells us they had a breeding population up there,” Jacobs said. Fiorillo added that the presence of a juvenile also offers a small glimpse into Alaska’s environment at the end of the Paleogene Period. “The baby also tells us that this area along the Alaska coast was biologically productive enough to make it a good place for raising a family,” he said. In the end, the discovery of the Unalaska specimens doesn’t demystify the origins of the desmostylians, or their fate, but it does provide precious new data about one of the more perplexing members of the class of mammals. For these insights, the researchers named the new mammal Ounalashkastylus, for the people of the native Ounalashka Corporation who made the find. Jacobs, Fiorillo and their colleagues report their findings in the journal Historical Biology.